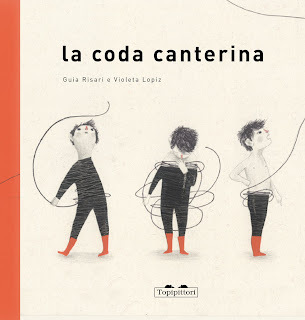 "La coda canterina", texts by Guia Risari, illustrations by Violeta Lopiz, Publisher Topipittori, March 2010. Let's try to remember how many kind of tails we know: there's the dog's tail, always ready to waggle; the cow's tail, that sometimes has a funny tuft at the end; the noble and luxurious horse's tail; the beaver's tail, flat and rounded, just like a scull; the squirrel's springing tail, always perfectly combed; the lion's tail, with a small mane at its edge; the cat's tail, that blows like a could ready to pour rain when the cat is hungry. Well, for all the tales you'll be able to remember, I am sure that none, and I mean none, will ever be like this tail. Why? There are at least three good reasons: the first is that this tail belongs to a child; the second consists in its length that equals earth's circumference; the third reason is that this tail sings with a heavenly voice, it sings so well that it would bewitch everybody, you too! But let's start from the beginning: one morning a boy wakes up but he's not alone anymore, he is in company with a tail, his tail. The night before it wasn't there and now, here it is, firm at its place. The boy tries to hide it at first, without success, he then tries to drawn it in the bathtub but with no result. The tail starts to produce noise, at the point that the boy's parents end up breaking into the bathroom and discover the mystery. Oh my God, a tail! Worse: a singing tail! A cheeky tail that doesn't obey mom and dad's orders. What to say? This is an awful, awkward, perturbing situation. If you lived as well "in un paese minuscolo, così piccolo che il nome era più grande del paese"*, then you would know that you can't keep a secret too long. Much better involve also the other inhabitants then, not to afford the situation alone, who knows, maybe somebody could find a resolution to the problem. No inhabitant of the village sees the tail as a deformity, it's more an inconvenient they want to get rid of: it's a problem that needs a resolution to be found all together. This is why, when someone suggests pulling the tail, the whole village is ready to help. It's a fun picture book, surreal, that unties (this is really worthy saying) around an unusual protagonist like only a tie singing old Russian folk songs can be. This book has an old-fashioned taste from some point of view, starting with the sing-song the tail is singing, to end with the tiny-winy village, where everybody knows each other and help out; it's also a bit rural, for that strong sense of community that recalls life in the old farm-yard houses of the beginning of the twentieth century. Though nothing makes us understand if this is true as this is, at the same time, a perfectly modern story. 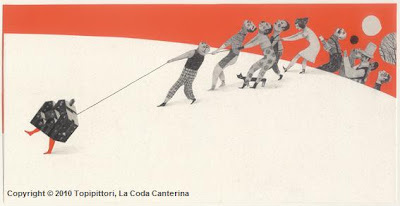 Guia Risari is very good at measuring little hints of magic, with a good amount of ironic and amused smile, mixed with the more concrete reality of the little village portrayed in its typical dynamics. A nice text, pressing, with a cultivated language. 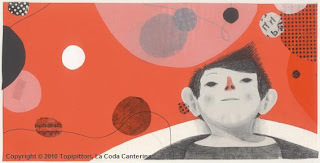 The illustrations by Violeta Lopiz, all played around a very simple chromaticism (white, black, different shades of grey and red) and a mixed technique, are wonderful. Her characters so well defined and recognizable go with the tale underlying the crescendo of the urgency, emphasized by the text's rhythm. The plate where the boy's parents are portrayed in foreground, once they get to know about the problem, is simply stunning. This book is a beautiful journey: the fellow-countrymen's journey, pulling the tail till they go round the world, and our journey as, page after page, we discover what can't be seen. Copyright© text and images by Topipittori 2010. Images have been reproduced with the permission of the Publishing House. *"in a tiny village, so tiny that its name was bigger than the village itself"